In the digital age, whistleblowing has become the order of the day. Anyone holding confidential information can easily make it available to the rest of the world by posting it online, and organisations like WikiLeaks have specialised in receiving, processing, and disseminating leaked information. Whistleblowers are celebrated as "heroes of our time" because of their contribution to “ethics and integrity" (UN 2016). Underlying this view is a presumption that whistleblowing does not merely lead to sanctions against the individuals and companies whose illegal or immoral actions are exposed, but affects and improves behaviour more broadly. Such a deterrence effect is consistent with standard economic theories of crime if whistleblowing is perceived as increasing the likelihood that crime is detected and sanctioned (Becker 1968). However, so far this has not been documented empirically. Leaks from banks in tax havens provide a useful laboratory for studying whether and to what extent whistleblowing deters crime. While bank accounts in tax havens are not illegal per se, they often serve to evade taxes (Alstadsæter et al. 2017), which makes account holders and sometimes also the bankers assisting with the tax evasion liable to criminal prosecution. Hence, for owners of tax haven accounts as well as for bankers in tax havens, leaks of customer files involve a risk of legal sanctions if the information is acquired by the tax authorities and public humiliation if posted online. The first leak of this type came from LGT Bank in Liechtenstein when a computer technician extracted and distributed customer information to tax authorities in several countries. The leak became publicly known on 14 February 2008, when German police raided the premises of Klaus Zumwinkel, the chief executive of Deutsche Post, and detained him on charges of tax evasion. It soon became clear that the charges were based on leaked customer files that also contained incriminating information about hundreds of other German tax evaders. The affair attracted global attention and was prominently covered by media such as The New York Times, Le Monde, Die Welt and El Pais in the following days. Soon followed other leaks from banks in tax havens, most prominently from HSBC Private Bank in Switzerland in 2009, which became known as ‘Swiss Leaks’ when it was published by the International Consortium for Investigative Journalists (ICIJ) in 2015. In a recent study, we investigate whether the leaks of customer information from banks in tax havens have acted to deter the criminal use of offshore banking services (Johannesen and Stolper 2017). In our main analysis, we estimate the effect of the data leaks on the stock prices of banks that are known to provide such services. Stock prices reflect the net present value of expected future profits given all available information. Therefore, if we observe a drop in the stock prices of these banks precisely at the time when customer information is leaked, this is plausibly because financial markets expected the profits associated with criminal offshore services to decrease. Conceptually, a decrease in expected bank profits could derive either from the offshore banking market's demand side (an inward shift in the demand curve) or supply side (an outward shift of the cost curve). In either case, the equilibrium quantity of criminal offshore services would be lower than before the leak. 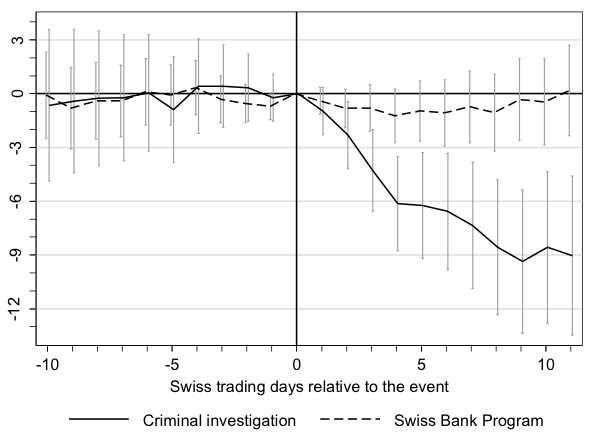 Figure 1 shows the abnormal return of 46 Swiss banks in a 21-day window centred around the data leak from LGT Bank. The sample is carefully selected to include only banks that have admitted to assisting customers with tax evasion – some in the context of criminal investigations initiated by the US Department of Justice, and others in the context of a US legal programme that allowed Swiss banks to resolve criminal liabilities through full disclosure of their cross-border activities and payment of appropriate penalties. As shown in the figure, the banks in our sample tracked the normal return closely in the ten days preceding the leak, but earned an abnormal return of -2.2% over the first four days following the leak. These findings are suggestive that the leak from LGT Bank lowered market expectations about the future earnings of tax haven banks that assist foreign customers with tax evasion. The most plausible interpretation is that markets perceived the leak as an effective deterrent of offshore tax evasion. Since offshore tax evasion had never previously been exposed in the context of a leak, offshore account owners and bankers most likely did not account for this risk before the leak from LGT Bank. Alternatively, they may have assigned a very small probability to the possibility of a leak and updated their beliefs about this probability the first time a leak occurred. In either case, an increase in the perceived probability of a leak should be expected to deter the demand and supply of criminal offshore banking services and reduce the earnings of offshore banks. A number of additional empirical tests support this interpretation of the main result and provide further evidence of the mechanisms at play. First, Swiss banks with no links to offshore tax evasion earned no abnormal returns in the days after the leak. 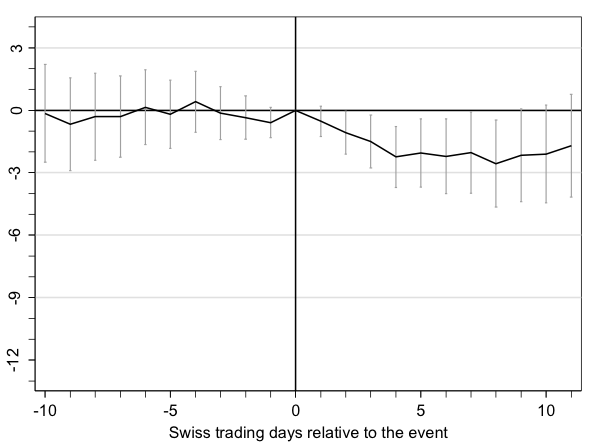 Hence, the negative excess returns in the main sample are not driven by confounding shocks affecting the entire Swiss financial sector. Second, subsequent data leaks from tax haven banks were not associated with abnormal returns, suggesting that the very first leak led offshore account owners and bankers to incorporate the risk of whistleblowing into the calculus of tax evasion, whereas subsequent leaks were not associated with a significant updating of the beliefs about this risk. Third, prominent news stories about tax havens not involving data leaks, e.g. the announcement that the president of FC Bayern Munich was under investigation for tax evasion through Swiss bank accounts, were also not associated with abnormal returns. This suggests that media attention in itself does not reduce the stock prices of offshore banks when it carries no new information about the risk of detection for tax evaders. Lastly, we explore the heterogeneity of the stock market responses to the LGT leak within the sample of Swiss banks with a known link to tax evasion. As shown in Figure 2, the response was much larger for the banks investigated by US prosecutors than for the banks subsequently resolving their criminal liabilities through voluntarily disclosure. Presumably, US prosecutors selected Swiss banks for investigation based on ex ante information about their involvement in offshore tax evasion – market participants with a similar information set would plausibly expect the same banks to be most adversely affected by an increase in the risk associated with offshore tax evasion. We also conduct a complementary analysis of the deterrence effect of the LGT data-leak using country-level data on foreign-owned bank deposits from the Bank for International Settlements. As shown in Figure 3, the foreign-owned deposit stocks evolved very similarly in tax havens and non-tax havens before the leak. However, there is a sharp and statistically significant divergence during the first quarter of 2008 with deposits in tax havens decreasing by more than 10% relative to deposits in non-tax havens. This estimate is clearly consistent with a significant drop in the use of criminal offshore banking services following the leak and, under plausible assumptions, the magnitude is consistent with the estimated drop in the stock market value of Swiss banks. While a number of studies have described which conditions are conducive to whistleblowing (e.g. Dyck et al. 2010) and a broader literature in law, economics, and criminology explores the role of transparency and public information in deterring criminal behaviour more broadly (e.g. Kahan and Posner 1999, Bo et al. 2015), the findings described in this column constitute the first empirical evidence on the deterrence effect of whistleblowing. Our findings also relate to a growing literature investigating the factors that shape offshore tax evasion, for instance tax rates on capital income (Hanlon et al. 2015), tax enforcement (Johannesen and Zucman 2014, Johannesen 2014, Omartian 2016) and tax amnesties (Alstadsæter et al. 2017; Langenmayr 2015). Alstadsæter, A, N Johannesen, and G Zucman (2017), “Tax Evasion and Inequality”, working paper. Becker, G S (1968), “Crime and punishment: an economic approach”, Journal of Political Economy 76(2), 169-217. Bo, E E, J Slemrod, and T O Thoresen (2015), “Taxes on the internet: deterrence effects of public disclosure”, American Economic Journal: Economic Policy 7(1), 36-62. Dyck, A, A Morse, and L Zingales (1991), “Who blows the whistle on corporate fraud?”, Journal of Finance 65(6), 2,213-2,253. Hanlon, M, E L Maydew, and J R Thornock (2015), “Taking the long way home: U.S. tax evasion and offshore investments in U.S. equity and debt markets”, Journal of Finance 70(1), 257-287. Johannesen, N (2014), “Tax evasion and Swiss bank deposits”, Journal of Public Economics 111, 46-62. Johannesen, N, and T B M Stolper (2017), “The deterrence effect of whistleblowing – an event study of leaked customer information from banks in tax havens”, working paper. Johannesen, N, and G Zucman (2014), “The end of bank secrecy? An evaluation of the G20 tax haven crackdown”, American Economic Journal: Economic Policy 6(1), 65-91. Kahan, D M, and E A Posner (1999), “Shaming white-collar criminals: a proposal for reform of the federal sentencing guidelines”, The Journal of Law and Economics 42 (S1), 365-392. Langenmayr, D (2015), “Voluntary disclosure of evaded taxes - increasing revenues, or increasing incentives to evade?”, Journal of Public Economics 151, 110-125. Omartian, J (2016), “Tax information exchange and offshore entities: evidence from the Panama Papers”, working paper. United Nations (2016), “Promotion of a democratic and equitable international order”, Fifth report of the independent expert, Alfred-Maurice de Zayas, to the General Assembly, August.